Put a new spin on pumpkin pie this Fall! 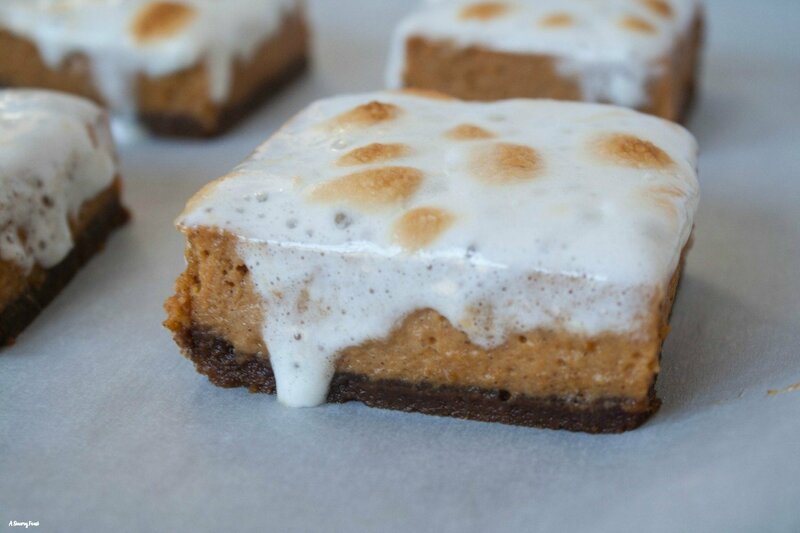 This dessert features the flavor of pumpkin pie in bar form, with a flavorful gingersnap crust. And on the top, some toasted marshmallows! Pumpkin pie is a MUST for Fall! I’ve made it even easier to enjoy by putting it in a bar. Instead of a plain pie crust, I made a homemade gingersnap crust. To make these bars extra special, I topped them with mini marshmallow just before they were done baking. Using the broiler, I toasted them just a little. It makes these bars so pretty but also adds some extra flavor and sweetness! Whenever I have a slice of pumpkin pie, whipped cream is always a must for me. It’s just not quite enough to eat the pie on it’s own. But now that I’ve made these bars, I think that marshmallows makes an even better topping! And that gingersnap crust… mmmmm! I prefer the extra flavor of a gingerbread crust for pumpkin pie instead of a regular, plain crust. Plus this recipe uses just two ingredients to make the crust! 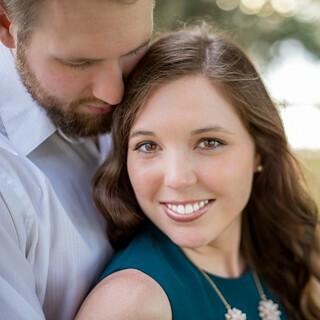 So stinkin’ simple. These bars can be made 2 different ways, depending on if you want to serve them immediately while they are warm, or make them ahead of time. 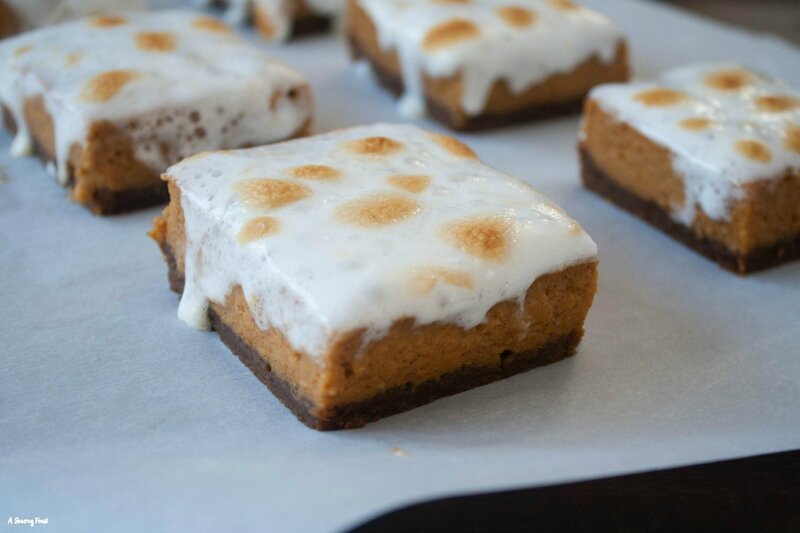 If you are serving them warm, take the bars from the oven and top with marshmallows and stick them under the broiler. 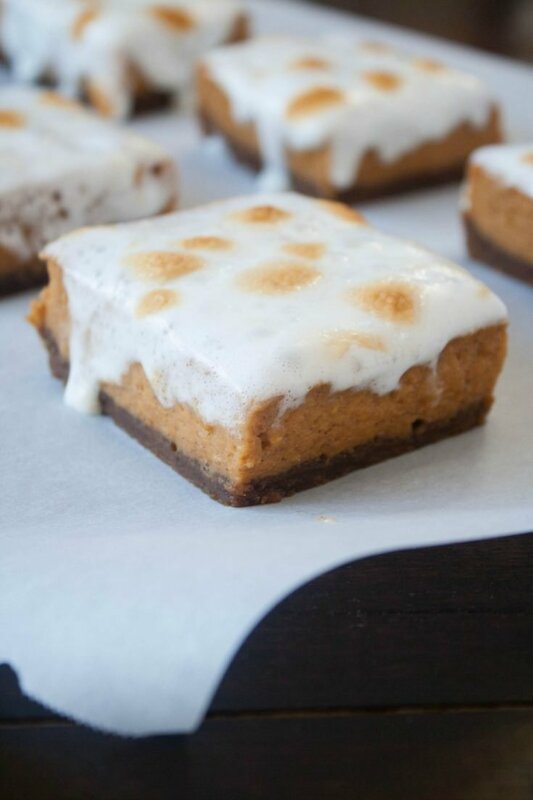 This will result in a warm pumpkin bar with melty marshmallow topping as shown in the pictures. 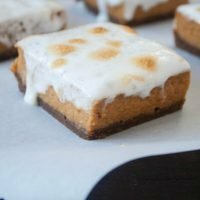 If instead you want to make them ahead of time, just let the pumpkin bars cool completely before topping with marshmallows and broiling. If possible, add the marshmallows just before serving! Put a new spin on pumpkin pie this Fall! 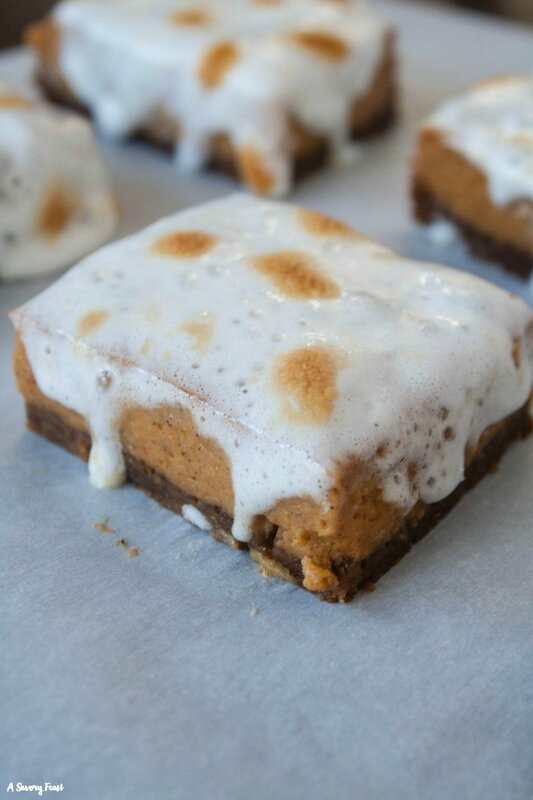 This dessert features the flavor of pumpkin pie in bar form, with a flavorful gingersnap crust. And on the top, toasted marshmallows! Preheat the oven to 350 F. Spray an 8x8 baking dish with cooking spray. Line the pan with parchment paper and spray with cooking spray again. To crush the gingersnap cookies, put them in a food processor, blender, or in a ziploc bag and crush using a rolling pin. In a medium bowl, mix together the crushed gingersnap cookies and melted butter until the cookie crumbs are coated in butter. Press the mixture into the prepared 8x8 pan. Bake for 8 minutes. Remove from the oven but leave the oven on. While the crust is baking, you can make the pumpkin mixture. Add the pumpkin puree, eggs, sweetened condensed milk, cinnamon, salt and pumpkin pie spice to the bowl of your stand mixer. Mix until combined and the mixture is smooth. Once the crust is done baking, pour the pumpkin mixture over the crust. Bake for 35-45 minutes or until the center of the bars are set and don't jiggle when you move the pan. (See notes before continuing if you won't be serving the bars immediately). Spread the mini marshmallows on the top in an even layer. Set the oven to broil and broil for 2-3 minutes or until the marshmallows begin to brown. Let cool slightly before cutting into the bars and serving. Store any leftovers in the refrigerator. 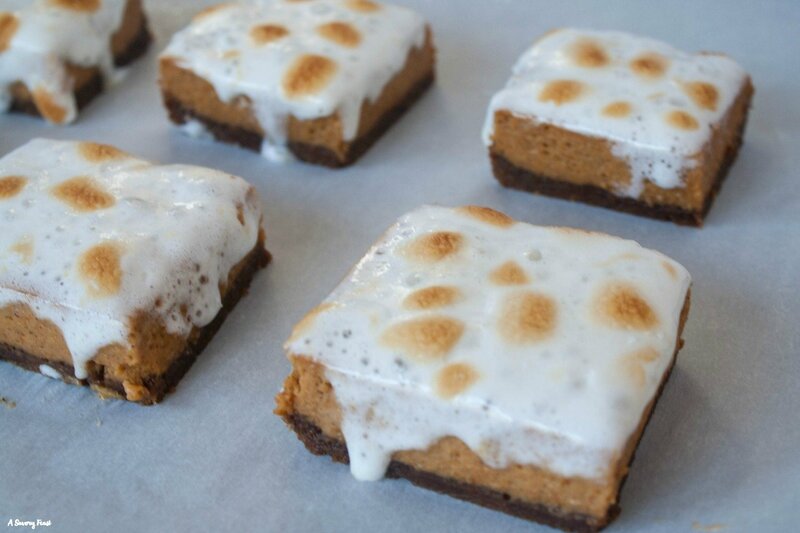 For melty marshmallow topping (as shown in the pictures), immediately set the oven to broil and broil for 2-3 minutes or until the marshmallows begin to brown. If you want the marshmallows to keep their form more, cool the bars completely before topping with marshmallows and placing in the oven under the broiler for 2-3 minutes. If you are planning to make these in advance, I would recommend the second option, otherwise the marshmallows might melt too much before you serve them. Are you a pumpkin pie fan? What is your favorite version?